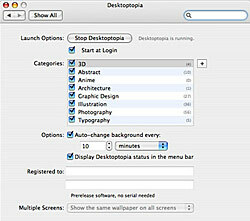 Desktoptopia is a desktop background manager for the Mac that automatically loads and displays designer desktops from our ever-growing master collection, on your monitor, as often as you wish. Made for designers/by designers to keep you inspired with the freshest desktops. The master collection grows everyday, so you’re sure to to be inspired with the freshest and latest designs. If you are interested in purchasing Desktoptopia ($20), Web Designer Wall’s readers can enter coupon code “luckyme” at checkout will get 50% off (valid until Sept. 18, 2007). might like something like this. The technology is actually pretty cool. We’re using RSS feeds to send the images and there’s a rating algorithm to show you art you like more often, and art you’re not crazy about less often. There’s also a place in the system preferences where you can add your own feeds from sources like Flickr. We have a database of desktops artist have submitted, and we take great care as to what makes the cut. Artist review submissions and only the best make it in. And of course, it’s all work safe imagery. Nothing you’d be embarrassed about if your mom saw it. The artist like it because it’s a source of inspiration, and a way to get discovered. All art submitted links back to the artists site from the Menubar icon in Desktoptopia. We’ve already gotten reports of artist getting work from Desktoptopia. Our team is very diverse and global. Our programming work is done in Germany, Marketing in the USA and our artists are from all over the world. So far it’s been very well accepted, and we have a ton of great ideas to enhance Desktoptopia in the future. How did you do the sliding images? It is awesome! Thanks Nick! Nice find, but too bad you have to pay for the manager. Ah too bad I have a PC. I need a mac. Bad. I’ll agree that it’s cool, but not something I would spend money on. Guess I’ll enjoy my remaining 10 days of free trial. For me, about £10 (possibly lower as the pound is string against the dollar ATM) is a great deal and I feel I like something I willing to pay. Everybody has to earn a living some how. Get 50% of it using the coupon code ‘luckyme’ :D, $20 I wasn’t sure about, but for £5 I’m sold! If it were a free program, I might give it a try. But I’d rather just find desktops I like, save it to a folder, and let my iMac automatically change between them randomly every hour. the artwork on here is incredible, i really wish it didnt cost anything, my free trial will be an enjoyable experience though. Another unrelated question. How long would you say it took to design this site. just wondering becuase it’ so well done. I have a mac but i won’t buy this. Too much for such a simple app! Too bad! Well… I’ve got a PC, but I wouldn’t pay so much for that app if I had a mac. The thing is, some of the better desktops featured on this site are certainly available for free from the original artists. I recognize David Lanham’s work in the samples shown above, and it’s free to download the wallpaper from his site – which curiously enough, isn’t linked in the artist’s profile at Desktoptopia. Also, one of the iPhone wallpapers is an older version of the Hicks Design logo. it would be perfect if desktoptopia would have a cover icon fonction like the one in deskshade. do you mind if you share the codes for that nice gallery? Is there a copy of dektoptopia available for windows xp as well? lol or you can do what I did… keep it for 10 days as a trial and printscreen all the best desktops and use them at your own leisure. guys? It’s a free download on the apple website. I love it!! What happened here? Desktoptopia website appears to be gone. A family member of mine changed my background on me while Desktoptopia was running and the application crashed. After I was unsuccessful in getting it to work once again I decided to try and uninstall it and then download it again. When I went online searching of the website it just wouldn’t load. So I went to alternative downloading websites and I could not get anything working or the download to even start. I have used Desktoptopia for 4 years now and now that it is gone and I have no way of getting it back I don’t know what to do with myself. Can anyone tell me what happened? Somebody please explain what happened to Desktoptopia! Mine seems to have quit running and I can’t get a download to work now… are you gone for good or is this just a temporary glitch? Help! The links you two have given appear to be dead ends to me. One is in another language that I cannot understand, nor translate via Google Web Translator, and the appears to be a very uninteresting blog. Why would you post those links? What the hell guys? I have a little problem with Desktoptopia. You see, I donwloaded the program but the pictures which normaly come with it (like the pictures in 3D or Animations doesn’t show up ! So the program is installed but nothing changed. Futhermore, I tried to go on the links “http://desktoptopia.com” but it seems that this links doesn’t exist anymore. Can anybody help me ? It seems like Desktoptopia isn’t available for download anymore and all their backgrounds are long gone. That’s sad! So we decided to create a similar service collecting a great set of desktop backgrounds and have them automatically download and change on your Mac. If interested, sign up for our notification list at http://wallpaperyapp.com and you will get notified when we release it (within a month). white iphone 4 available now. It is the best news today. Want to buy the hotest white iphone 4 Conversion Kit? http://www.whiteiphone4.com will be your best online store. Don’t hesitate to buy the charming iphone 4 Conversion Kit! I stumbled on this while googling for some lyrics, I’ll be sure to come back. thanks for sharing. It is the best news today. what happened to this service i connot get the xml feed to work. You see, I donwloaded the program but the pictures which normaly come with it (like the pictures in 3D or Animations doesn’t show up ! So the program is installed but nothing changed.